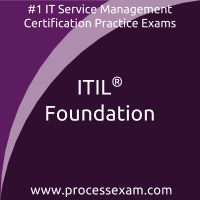 ITIL Foundation Mock Test became a cakewalk for me as i enrolled for paid service. With features like detailed progress report made me analyze my weaknesses and strengths on regular intervals. I would like to thank ITIL Foundation mock tests. Premium membership for ITIL Foundation exam on this site gave me so many mock tests and various features like analysis, result history, free updates, unlimited attempts for two months, etc al. Thank you very much. Je viens de France. J'ai obtenu un bon pourcentage à l'examen itil foundation et j'ai eu du succès dans un emploi. Merci processexam.com d'être toujours là pour préparer l'examen de certification itil foundation. The questions on this site make you feel that you are giving actual itil foundation exam. It is the best site i have ever come across. This site has given me the confidence to succeed in my professional life. The mock tests are designed to give you maximum coverage of the syllabus and even revise the syllabus through results. That is one of the great features i have come across. 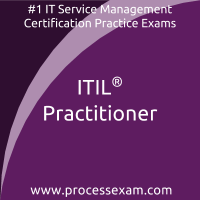 I am sure that everyone would like to prepare for itil foundation in this manner. Right from scoring system to time limit, everything is same to same, like the actual exam, in the practice tests. My result of 90% in ITIL Foundation is the blessing of my hard work on this site.